For a spectacular holiday celebration, include the Pomegranate Ginger Sparkler. As beautiful as this is; it’s also easy for a crowd. Just mix up the ingredients, pour into glasses and top with chilled sparkling wine. Done! Sometimes blogging brings big surprises and today it wasn’t all bad. When I went to add a new image to this post, for some odd reason it was put back into draft status even though it originally posted in 2016 and I expected it to be one of my published posts. I’m not sure how or why that happened but it should not have; this Pomegranate Ginger Sparkler is way too beautiful, way too delicious and certainly way too perfect for the holidays to be lost and forgotten…so I’m introducing it again! 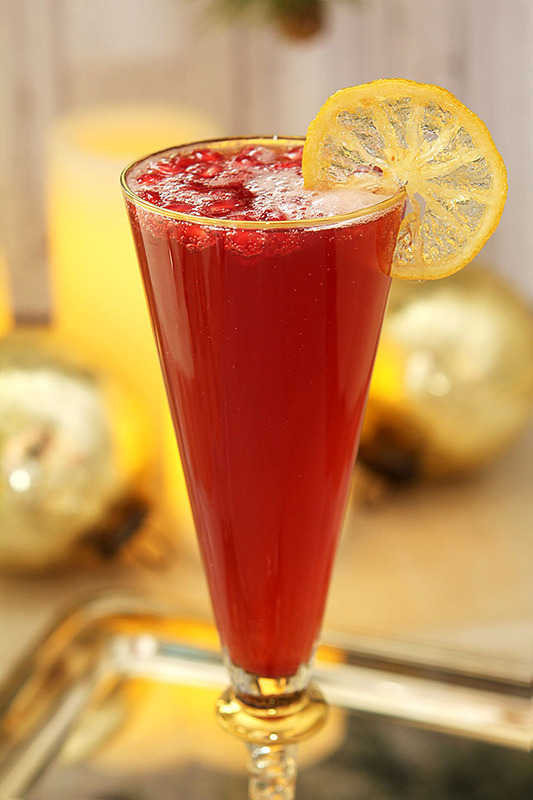 This Pomegranate Ginger Sparkler is not just my favorite holiday cocktail made with sparkling wine but it was a big hit at a NYE party I had a couple of years ago; it’s gorgeous and so perfect for the season. I could wax poetic about how much I love celebrating New Years Eve but the truth is I’m more like my neighbor Sam. When mentioning another neighborly get together for New Years he loved the idea of a French celebration (on France’s time zone so we can be done by 4pm) and Sam is my daughter’s age! Still, no matter the time there will be a glass raised to celebrate the end of another year and toast the possibilities of the one we’re entering. It is certainly a bittersweet moment; saying goodbye to the good and the bad of the past and always with a hope of the things to come. This cocktail is simple to make but also perfectly beautiful. Pomegranate juice, lemon, ginger and sugar are all simmered together for a few minutes then chilled and topped off in a champagne glass with some sparkling wine. Sounds simple right? And it is. Simply the best. Seriously one of my favorite cocktails of this year. It’s all about that touch of ginger. And it is just a touch but it adds such a nice little zing to this beauty that makes the end result perfect. The color, the taste, the sparkle…all of it. It was perfect for a party too. No dealing with measuring while guests wait, just make a batch or three and simply pour into glasses and top with Prosecco (Italy’s version of Champagne!). Whether you stay up til all hours or are planning your own European New Years (do it! ), this should be on your list of have to haves; it’s that good. Though I’m not yet ready to start doing multiple cocktails every week, I have teamed up with a friend to give you two today…I mean it’s a holiday after all! Shanna is the blogger behind the blog Pineapple and Coconut and I think she told me the story about that name but all I think of when I see it is Hawaii. She is not from Hawaii but seems her heart and soul is. Or Bora Bora on off days. She’s made a gorgeous cocktail for New Year’s Eve using St. Germain Liqueur, one of my very favorites. Combined with some pear sorbet and champagne…can’t you just taste the deliciousness? 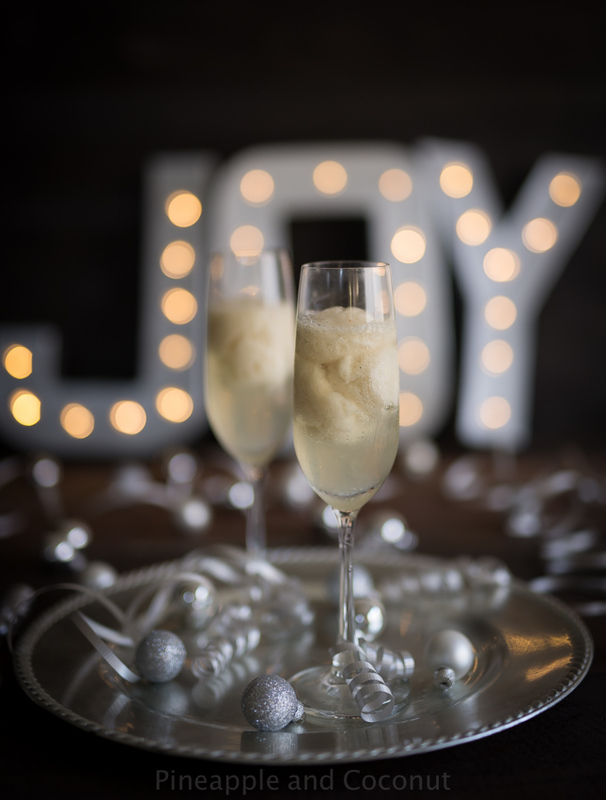 An elegant New Year’s cocktail made with a spiced poached pear sorbet that’s been spiked with flowery St. Germain liqueur and is topped off with chilled Prosecco. The sorbet flavors the cocktail with every sip while also keeping it chilled. Perfect isn’t it? Shanna looks prepared to stay up way past my bedtime but then she does live in Vegas. I’m betting she celebrates on Hawaiian time…so all into the next day! Scoot on over to her blog and check out this recipe; nothing wrong with having two cocktails for guests at your party – call this one dessert! I hope you’ll try one or both for your festivities. I find my guests look most forward to what cocktails I’ll be making so I put my time and attention towards them…and ask them to each bring an appetizer to share. It works for everyone and I love sharing cocktail creations with my neighbors. We all get along so well; hmm, maybe it’s the booze! The post Pomegranate Ginger Sparkler Holiday Cocktail appeared first on Creative Culinary.